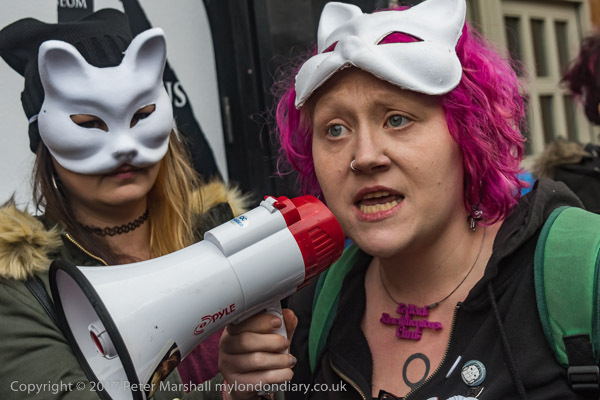 Class War and London 4th Wave Feminists protested again outside the Jack the Ripper tourist attraction in East London, calling for it to close. They say the so-called ‘museum’ exploits violence against women, making money from images of sexually mutilated women, and encourages attitudes that lead to violent sexual assaults. One of the women taking part in the protest had recently called the police after finding a 17-year old woman collapsed at her doorstop who had been raped several times on the streets. Tower Hamlets council has found the shop in breach of planning applications over its shutters and signage but has failed to enforce its decisions. It was a difficult protest to photograph because the pavement outside the shop is narrow and a car was parked in front restricting access. Police were trying to keep a clear way through past the shop, and, together with the two female security staff specially brought in by the shop, trying to make it easy for customers to enter and leave the premises. As can be seen from the picture at the top of the post, there was a considerable amount of pushing by the security staff at times, and also some angry reactions from a few customers. Considering it was a Saturday afternoon there seemed to be very few of them, and I think some stopped and listened to the protest and turned away. Most tried to avoid the eyes of protesters as police and security took them in or out. 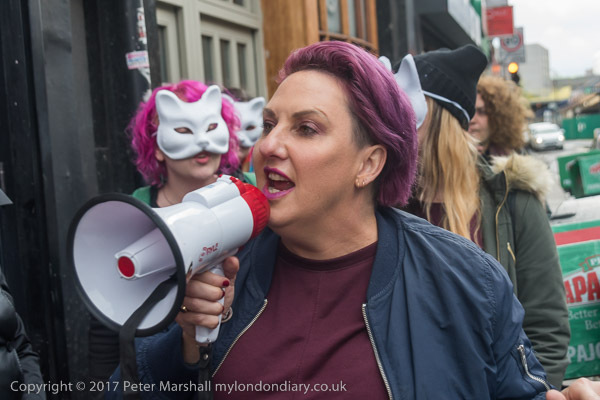 There were several short speeches about the reason for the protest, the failure of the local authority, the lives of the victims and the attacks on women which still take place in this area as everywhere else. 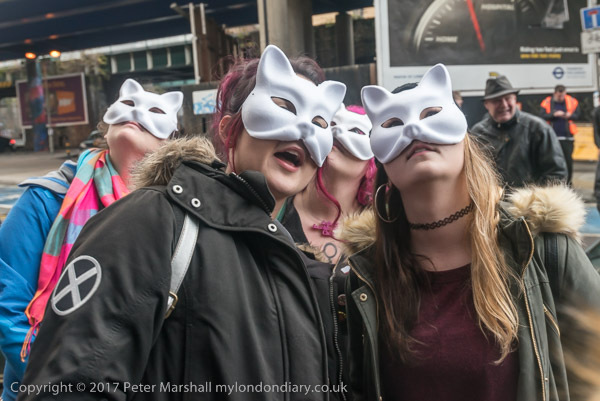 Violence against women is a problem across the world, and the protesters pointed out to the police that they were failing in their duty to protect women from it while coming to protect tourist attractions which promote and allow people to come and take a prurient, unhealthy interest in it. 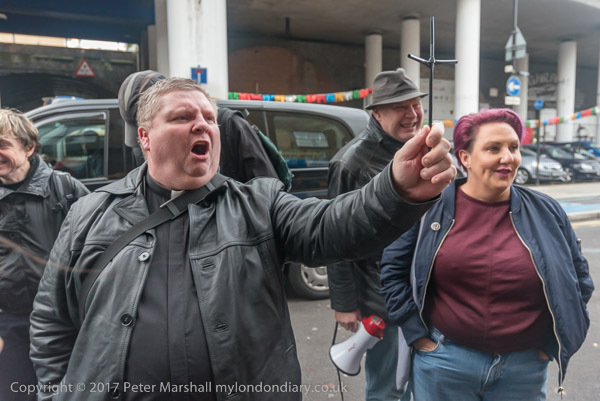 There were some heated arguments with the police, and Patrick, playing the part of ‘Father Brannigan’ continued to call out the demons with the aid of a rather makeshift cross. 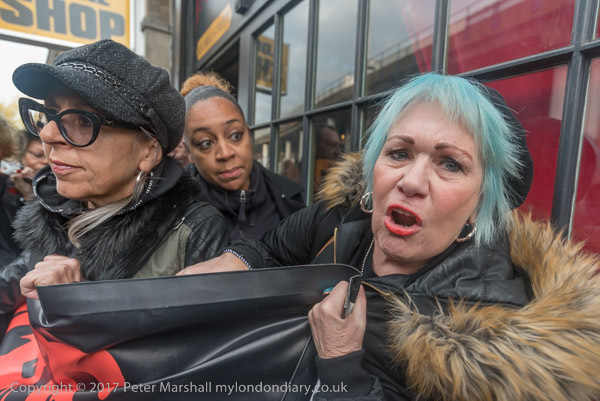 After an hour or so of protest, the group retired to a nearby pub, and I was about to leave when the police raided the place, coming in to arrest a trans-gender woman alleged to have assaulted an anti-trans activist during a protest at Hyde Park in September. She has pleaded not guilty and her trial opens shortly. I was obstructed by a member of the bar staff who showed me her warrant card as a special constable while attempting to follow the police as they left and she later tried to stop me taking pictures on the pavement outside. 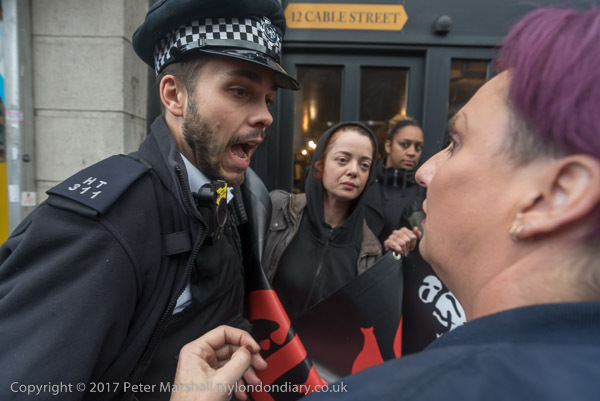 I’m pleased to say that the police officer in charge told her to stop, telling her that I was quite entitled to photograph what was happening. I decided at the time I would not post these pictures until after the case had ended or been dropped. This entry was posted on Friday, April 13th, 2018 at 09:25 am and is filed under My Own Work, Photo Issues, Political Issues. You can follow any responses to this entry through the RSS 2.0 feed. You can leave a response, or trackback from your own site.